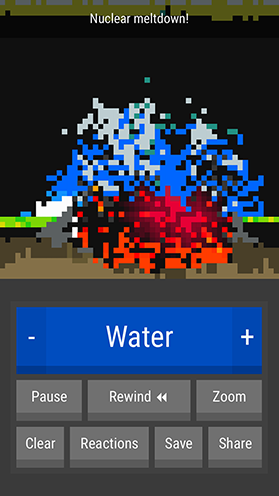 ReactionLab 2 is a critically acclaimed 8-bit particle sandbox inspired by ‘Falling Sand’ and ‘The Powder Toy’. Let your inner mad scientist shine by drawing elements onto the canvas and watching them interact in real time. Featuring 80+ elements, hundreds of different particle types, and nearly 140 achievements to attain. There are endless creative possibilities and undiscovered combinations. Try to find every reaction, or just build something awesome; it's up to you! -- Massive reactions list and over 80 elements. -- Freely pause and rewind time. -- Zoom tool with minimap. -- Save creations locally or share them with others online. Eraser, Concrete, Steel, Water, Fire, Electricity, Ice, Wood, Plant, Snow, Wax, Plastic, Acid, Vinegar, Baking Soda, Lava, Rock, Dirt, Coal, Sand, Glass, Uranium, Salt, Potassium, Phosphorus, Caustic Gas, Chlorine, Steam, Neon, Radon, Hydrogen, Propane, Oil, Gasoline, Nitroglycerin, TNT, Fusion Bomb, EMP Bomb, Fuse, Steam Turbine, Battery, Electric Pump, Heating Coil, Torch, Drain, Crystal, Aerolucent, Aqualucent, Black Hole, Force Field, Plague, Anti-Matter, Plasma, Life, Clone Emitter, Dry Ice, Sulfur, Ray Emitter, Thermocouple, Vanish Barrier, Oscillator, Fan, Sludge, Unobtainium, Sponge, Electrode, Ivy, Spores, Insects, Iron Filings, Magnet, Sapphire, Mirror, Soap, Switch, Radiation Converter, and Cement. Stats: 10861 user-made creations uploaded so far. -- Added 12 new elements and 21 new reactions. -- UI and animation improvements. -- Improved support for very high resolution displays. -- Added three new elements: Sponge, Electrode (-), and Electrode (+). -- Added eight new reactions. -- Upgraded share server to be compatible with upcoming iOS release. 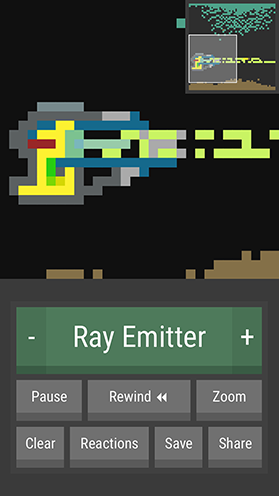 -- Minor UI improvements including larger element buttons. -- Bug fixes and performance improvements. -- Improvements to share menu reliability. -- Added share feature: browse the best creations from around the world and upload your own! (The network permission is now requested for this reason only). -- UI improvements and smoother animations in menus. -- Better support for very high resolution displays. -- Fixed issues with Nexus 9. -- Many bug fixes and performance improvements. -- Added three new elements: Fan, Sludge, and Unobtainium. -- Added several new reactions. -- Official support for Android 5.0. -- Fixed performance issues with Android 5.0. -- Many bug fixes and visual improvements. -- Minor bug fixes and improvements. 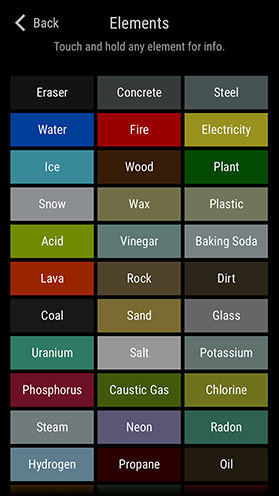 -- The element list is now searchable. -- Minor UI improvements and bug fixes. -- Added six new elements: Force Field (vertical), Vanish Barrier, Thermocouple, Oscillator (vertical), Oscillator (horizontal), and Ray Emitter. -- Added many new reactions. -- Element list is now scrollable with larger buttons. -- Improvements to save & load UI. -- Element tweaks, bug fixes and performance improvements. -- Added three new elements: Clone Emitter, Dry Ice, and Sulfur. -- Performance improvements and bug fixes. Changes introduced in iOS 12.0 made ReactionLab 2 unable to run on newer iOS devices. It continues to work on devices running iOS 11 and below, but will no longer be available on the App Store. -- Fixed a bug which could occasionally prevent the game from starting.